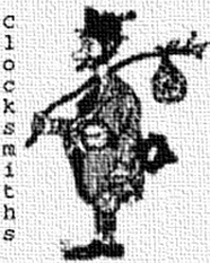 Mike's Clock Clinic's Web Site by Mike Murray ! I'm an expert concerning the Atmos clock ! overhaul Instructor, but no longer and I have no alternatives. I have many Atmos parts for sale. For more information please see: My Atmos parts Sales page. Aftermarket Atmos parts are still available: Aftermarket Atmos parts. I'm experienced with all eight ( 8 ) caliber's (models) of Atmos clocks. My Atmos Clock & Anniversary Clock ONLY Web site. But what is an Atmos clock and what does it look like ? I have a repair list for Dating the Atmos which will date your Atmos via the serval number. The Atmos bellows. What is it and how can you tell if it's still good. Instructions are also provided to replace it yourself. Tips on placing the Atmos In-Beat. This assumes that the clock is NOT running and you are a professional. and a MUST for any Atmos owner or retailer. This page lists most of the Atmos parts and their availability. This page lists most of the Caliber 540 Atmos parts. This page lists most of the Caliber 519 and Atmos II Atmos parts. Please visit my Atmos Museum. I repair most Electric Plug In clocks. My Electric Clock ONLY Web site. 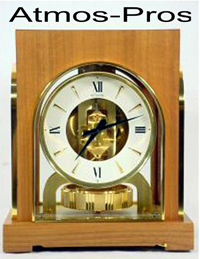 My Revere Electric Clock & Herschede Electric Clock ONLY Web site. Telechron rotor and other electric motor overhauls. My repair fees for the 400-day or anniversary clock. Please have a look at Basic Repair Fee Schedule for all other type clocks. It should be known that ALL work is done in house and by me personally. The exceptions are bellows refilling, dial refinishing and case refinishing. contains every Atmos and repair fee file that I have on the Internet. Earthlink FTP site contains EVERY file that I offer on the Internet. is devoted exclusively to hints, repair tips, and trade information concerning both clocks and watches. Time Information Blocks (TIBs) are compiled by Tim Sweet. These are little tidbits of information. The above FTP's contain information that can answer just about any questions you may have about clocks or direct you accordingly. My FTP's were and are the first ones to be devoted exclusively to clocks, watches and clock repair. I have over 90 files for you to d/l and/or view. This Web page only references a few of them. Internet via the FTP (File Transfer Protocol). I have three unique Web site page links to check out ! What is the time now ? Everything you always wanted to know about Clock Mainsprings. Clockmaker's Aid Version 3.0 is a HTML program for calculating pendulum lengths, pendulum adjustments, missing wheels, lathe cutting speeds, theoretical mainspring sizes, phases of the moon, plus various other goodies. Questions about specific age, identity, and value of both clocks and watches should be directed to one of the groups below. These will give you the broadest based Internet exposure concerning both clocks and watches. I will NOT respond to research or value questions. Horology's E-mailing Lists Sign-up Information. Recipient of the Links2Go Key Resource Award on Clocks Topic. I'd prefer all contact via E-mail but if you must call, please do so. Created on March the 4th of 1995 and last updated January 02, 2019.